The Bible speaks of many Godly men who have gone down in history as some of the greatest leaders, judges and kings of all time. We even see many poets, prophets and other prominent men. But when we are speaking of the principal patriarchs in the Bible we are talking about just five men. 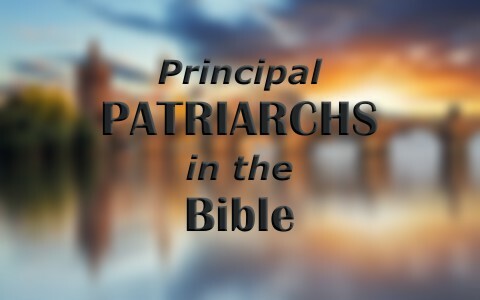 Take a look at some of the things that I found on the principal patriarchs in the Bible. The name Enoch means “dedicated” and he is most known as the man who walked with God. He actually never died, God raptured (took) him (Genesis 5:24). He was also the father of the man who lived the longest on earth, Methuselah. Genesis 5:18–24 And Jared lived an hundred sixty and two years, and he begat Enoch: And Jared lived after he begat Enoch eight hundred years, and begat sons and daughters: And all the days of Jared were nine hundred sixty and two years: and he died. And Enoch lived sixty and five years, and begat Methuselah: And Enoch walked with God after he begat Methuselah three hundred years, and begat sons and daughters: And all the days of Enoch were three hundred sixty and five years: And Enoch walked with God: and he was not; for God took him. Just like Enoch, we can also walk with God by pleasing Him because “By faith Enoch was translated that he should not see death; and was not found, because God had translated him: for before his translation he had this testimony, that he pleased God” (Hebrews 11:5). Though we may die a physical death we can still please God with our testimony here on Earth. Noah is translated as “rest”. We all know him as the ark builder. He was faithful to God even when everyone else doubted. He worked diligently on the ark that saved him and his family from death in the largest flood ever recorded in the history of Earth. He was the great grandson of Enoch and the grandson of Methuselah. His father’s name was Lamech. Abraham’s name means “father of the multitude”. He was the one appointed by God to be the father of the chosen people. In Genesis 11:27 we see Abraham’s father’s name was Terah and he had two brothers, Nahor and Haran. Haran had a son named Lot whom Abraham practically raised as his own when Haran died. Abraham married Sarai (Sarah) and they traveled much because God told them to “Get thee out of thy country” (Genesis 12:1). The name Isaac means “laughter” and was given to him because when Sarah was told she would bear Abraham a son at the age of 90 she laughed (Genesis 18:12-15). God announced to Abraham that Sarah would bear him a son in Genesis 17:19 “And God said, Sarah thy wife shall bear thee a son indeed; and thou shalt call his name Isaac: and I will establish my covenant with him for an everlasting covenant, and with his seed after him”. He was used by God to test Abraham’s faith when God told Abraham to offer Isaac as a sacrifice to Him (Genesis 22:1-14). Jacob was the son of Isaac and Rebekah and he had a twin brother named Esau. Jacob’s story is varied as we learn from the very start even the meaning of his name “the supplanter” tells of his future to steal his brother’s birthright (Genesis 25:29-34). The birth of the twins caused some animosity in the home because of favoritism — Isaac loved Esau and Rebekah loved Jacob (Genesis 25:18). When Jacob posed as his brother to receive his father’s blessing the hatred of Esau for his brother Jacob became so strong that Rebekah sent Jacob away to her brother’s house for his own safety. During Jacob’s journey he met Rachel and he made an arrangement to serve her father (his Uncle Laban) for seven years after such time Rachel would be his wife. When it was time for Laban to give his daughter Rachel to Jacob to wife, Laban tricked Jacob and sent his older daughter Leah into Jacob’s bed. After another seven years of service Laban gave Rachel to Jacob also. Jacob loved Rachel and when the Lord saw that Leah was hated, He gave her children while Rachel remained barren. After some time and several children that were born of Leah, her handmaid and Rachel’s handmaid, Rachel finally conceived and gave Jacob a son named Joseph. Rachel died in the birth of her second son Benjamin. All in all, Jacob had 12 sons. In one account Jacob wrestled with a man causing him to be injured in the hip (Genesis 32:24-30). This is when Jacob’s name was changed to Israel. Israel believed he saw God face to face and although the man never gives his name many theologians call this a “Theophany” or “Christophany” meaning one who appears as God or Christ. How wonderful it is to look at the lives and characteristics of these great patriarchs in the Bible? I pray that you look up the Scriptures that I shared so you can appreciate our Christian heritage through these great men of God. Read about some more men in the Bible: Who Were the Major Prophets? Previous post: What Are Modern Day Idols Christians Can Worship? Next post: Why Isn’t Discipleship Taught In Many Churches?